A Respect for the Past. A Cornerstone for the Future. Open Days/Time: Tuesday, Thursday & Saturday from 11 am to 4 pm. FREE for children/youth (under 18). Only $5 entry fee for Adults (good for repeated visits). 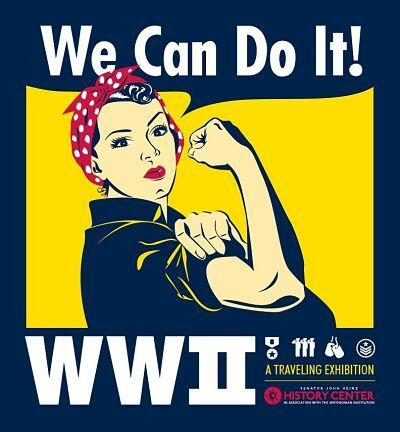 Explore Western Pennsylvania’s incredible impact on the home, industrial, and battle fronts during World War II through our NEW “We Can Do It! WWII” traveling exhibit Click HERE to read more about our schedule of events, discounts and movie show times. The Lawrence County Historical Society is proud to be a part of the Amazon Smile Program. Did you know that you can choose to shop on Amazon through our Smile link? It doesn’t cost you anything extra and when you do, we receive 0.5% of the purchase price for products that qualify for the Smile rating. All monies received are used to help support our volunteer organization. 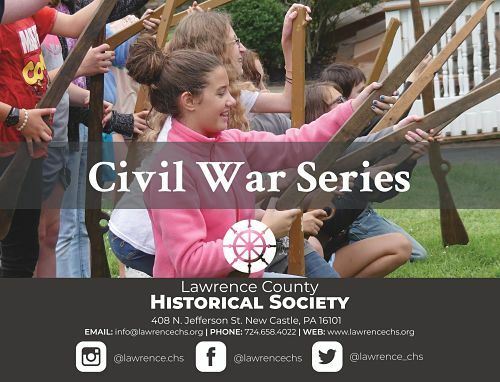 For complete Lawrence County Historical Society information, click on the photo below. Our .org site is currently used to make brief announcements.Thank you. Unless otherwise noted, all information and photographs contained on this page are the property of the Lawrence County Historical Society. No portion of this page may be reproduced without written permission of the Lawrence County Historical Society. 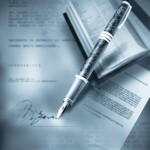 Email us for permissions requests through our LawrenceCHS.com site.